This guide is the know-all be-all guide to everything regarding how to operate a Vanilla Rust server. Skimming through this guide is recommended upon your first server startup to make sure everything goes smoothly. Most of the topics covered in this guide are tailored to our back end. If you like what you see, check out our Rust Server Hosting. If you would like to read more guides, check out our Rust Knowledge base for more content! Covered in this guide, we go through common questions we receive through our 24/7 live customer support. Almost all of your questions can and will be answered by this guide. From information as basic as how to find your Steam ID and advanced as setting up Admin RCON tools, everything you will ever need to know about running a Rust Community server will be listed below. Give this article a read, and if you have any other questions don't hesitate to contact us through our 24/7 live customer support chat. Thank you! There are a few bits of information which are essential to running a rust server. You must know your RCON password as well as your Steam ID. This section of the guide will teach you how to find this information. We recommend saving this information somehow, either saving a text file to your computer or writing it down on a sticky note. In order to use our Remote Console (RCON) service, you must know your RCON password. This is a built-in functionality to keep your server safe from hackers and unhappy users. This way, they will not have RCON access, which is supposed to be a tool for you to run admin commands and manage your server while offline. There are two ways to locate your Remote Console (RCON) Password. You can log in to our client area on our main webpage, and locate the server which you purchased. From there click on the server ID and it will tell you your RCON password within the server information panel. An alternate way to do this is to log into your server management panel with the TCAdmin information provided to you by your verification email. From there, click on "Game Services" on the left-hand side of the screen. Next, select the server you want to know the RCON password for, if you only have one service with us, it will automatically bring you to the server information page. From there, click on the "Actions" tab, and then select "show rcon pass." This will pull up a command window which pulls your RCON Password information from your server's command line. Both ways work, but in regards to finding this information for multiple servers, personally, I recommend the latter as you will be within your server management panel quite often and it's best to familiarize yourself with that panel. You will need to know your Steam ID for many applications such as plugins, Rust RCON tools, and certain admin commands. It's very simple and quick to find. First, go to your steam profile page and within the URL bar, copy your steam community profile URL, from there, insert it into the tool located here: steamid.io. Steamid.io shows information about your steam account and other user's accounts based on the steam community link. Information is given such as the users SteamID, SteamID3, Steam64 ID, and more. All of this information may be referenced by commands in other steam games as well so this is a useful link to bookmark. Rust allows you to either use a user's name or a SteamID to ban, kick, or modify user permissions. Permissions groups are further customizable with OxideMod Permissions. Check out our guide on the subject, Oxide Permissions 101! By the end of this section of the guide you will learn how to view your web console to troubleshoot startup issues, how to become an admin on your server, how to apply a steam update, and at the end, you will connect to your server for the first time. This information is very valuable to a server admin as you will need to do all of these from time to time. Rust actively pushes updates and patches multiple times a month, it's important that you may be able to update your server on a whim to the latest client version. Another very important thing to know is how to troubleshoot your server if something goes wrong. The best way to do this is to use the web console. Game Server Kings offers a web console client which shows the live command line of your Rust server. While the server is posting upon bootup or reboot, you'll be able to watch as it loads plugins, shows vital information about the server such as port binds, and connection status. This may require a little bit of technical knowledge, but it's not difficult to figure out, and you should be able to catch on quickly. GameServerKings has been operating since the summer of 2017, because of optimization steps we have taken since our debut, you will not need to troubleshoot issues after a fresh install of your server. We do recommend that you run a steam update, but the only time an issue will arise is if you decide to install oxide mod or Rust:IO on your server and there's a user error within config files. Using our web client, issues like this will be very simple to troubleshoot. Once you've entered our web client, you will see what looks like a command prompt filling your browser window. Issues which are caused by syntax errors will be seen within this prompt. For example, if you install a plugin, change some config files, and then the game tells you that the plugin isn't installed, this is most likely because Rust did not load the plugin due to an error. You will be able to see this within your web client by rebooting your server and watching it post. Once it's loaded, skim through the lines of information until you see plugin post data. There, it will tell you if your plugin was loaded or not. If it failed to load, it will tell you which line in the config file gave the error which caused it to fail. From there you can locate that line and fix the error easily. As becoming a server admin can be a difficult process when done manually, we've offered a way to do this quickly and easily using your server management panel. All you need to do is log in with your TCAdmin information provided to you by your verification email. From there, go to your "Game Services" tab and select your server. If you only have one server, you'll automatically go to its server management panel. From there, click on "Add an administrator." Go to your steam client and copy your steam community link for your steam profile. Next, paste that into the text field located within the add an administrator page. Finally, click Execute. A command window will pop up showing you the status of your admin file. It will tell you that the user was added, once it is, exit the command window and return to your server management panel. Reboot your server by pressing "Restart" and you will now be an admin on your server. Now that you're an admin for your Rust server, you'll be able to use console commands to administrate users. For a list of admin commands, check out our list of admin commands for rust. To apply a steam update on your server, normally would be a multi-step process. We have streamlined it into a one-button process. First, you must be logged in to your server management panel with your TCAdmin login information, from there, click on game services and select your rust server. If you only own one server, you will be automatically redirected to your server management panel. From there click "Steam Update." A command window will appear showing you the progress of your install. Once completed, it will tell you that the process is complete. If you have OxideMod installed it will also check for an update for that as well. Once everything has completed installing, you may close this window, go back to your server management panel and reboot your server. Now that everything you need to do is completed, you can log into your server for the first time. To do so start up your rust client, and within your client, press F1. This will open up your in-game console. From here type client.connect and then your Connection IP located within your server management panel. Now that your server is up and running, you may not immediately show up on the official server listing. The server identification process may take up to 24-48 hours. In the meantime, to help Rust's server browser find your server, we've found a couple things can help. First, change your server's name to something which is alphanumeric with the least amount of special characters. Once your server is found, all changes you make will be seen immediately by the rust server browser. Within your rust server, you may access and configure many game files at a whim. Using Game Server Kings, we make this easy. First, log into your game server management panel using your TCAdmin information given to you via your verification email. Then, go to "Game Services." From there, go to your File Manager. This will allow you to edit files within your server, alternatively, you can use an FTP Client like FileZilla to connect to your server-side files. If you would like to use FileZilla instead, we have a guide for you to use here. To edit your configuration file, our default path is /server/myserver/cfg/config.cfg. All server configuration parameters are listed within this file. To edit this file, open it by pressing the pencil icon. One thing you will want to change after you purchase your server is the name of your server, your seed, your world size, or even the entire map itself. This is done easily from within your command line manager. To access and modify the command line is simple. First, log into TCAdmin, then, go to your command line manager. From there, you will be able to modify default command lines. Within this guide, we'll show you how to modify basic server parameters from within default command lines which we offer. How to change your Hostname, Seed, and World Size, listed below. The New Server command line option is great for someone who just purchased their server, and wants to jump right in. Access this option by going to your command line manager, and selecting the "New Server" Default command line. The default settings are listed as so: Hostname "Rust Server" Server Identity "myserver" Seed "123456" World Size "2000"
A quick rundown of these parameters are listed as so: Hostname, This is what users will see as your server's name within the rust server browser. Server Identity, Your server identity is the name of the file which your server is saved under. If you want different server files running different configurations, you can change the value of the server identity, changing your directory from /server/myserver to /server/NewServerIdentity. This is useful for changing between game modes such as low decay servers to high decay servers on the fly. Or, alternatively, you can use this parameter to manage your saves between every reset, so that you have a record of servers which you have hosted. Seed, and World Size, These values are used to generate a new procedural map. In the case of certain command lines, such as custom maps, you willl not need to input these values, as they are not required for anything other than procedurally generated maps. By following this guide, you will be able to download custom rust maps via one of our command line settings. Keep in mind, you must verify that your custom map was generated on the latest version of Rust. If your map has not been generated on the current wipe cycle, or patch, you may not be able to use your map file or generate files required to run your server. There is NO WAY AROUND THIS. Please verify this first before moving forward, thank you. If you have access to a web server, you will be able to use the "Custom Map HTTP Download" default command line. You must set your hostname, as well as your URL for your custom map hosted on your web server. Lastly, you must not have a landing page for your file, it must be an automatic download link. Alternatively, if you do not have either a web server or an automatic download link, you may use Dropbox. To use Dropbox for your custom map download link, select the "Dropbox Custom Map" default command line option. From there, create a Dropbox account located at dropbox.com. Next, upload your custom map file to drop box. Now that your file is uploaded, you'll have to make a public link so that your server may access it. To do this, click "Share" next to your file, then copy your share link by clicking "copy link." Go ahead and paste it into your browser. You will see that the URL ends in "?dl=0" this signifies that this is not an automatic download link. To use this link for your server, remove the "?dl=0" parameter at the end of the URL and paste that into your command line parameter for Dropbox URL. Once you've made all of your changes, click apply, then restart your server. You can watch your file download progress within your web console. We've found a bug where, depending on the host server which holds your map file, it may take a while to set it up the first time it's used. You may find that your server is stuck on "Generating Ocean Patrol Paths" or a similar generation step. This is in many cases normal, and shouldn't have to do anything other than wait. If this process lasts for more than two hours, please contact us and we'll verify everything is set up properly. To Change your Server Description, it's never been easier. All you need to do is log in to your TCAdmin user panel, then go to your configuration files. You then must select your server.cfg file and open it with the text editor. Next, look for a line started with the parameter server.description. Change the text within the quotation marks to what you want your description to be. Please keep text alphanumeric, and you can start a new line with \n. For example, server.description "Thanks for joining our server! \nGame Server Kings offers the best public servers you can buy. \nFor more information, check out our knowledge base, or our homepage to purchase a server. \nThanks!" Once you complete your description, press save, and reboot your server. This will apply your new settings. In the past, we did not allow users to change their RCon Password. This was due to a security flaw making RCon Passwords seem unreliable. Now, we've made a workaround to fix this, and have added the option "Rcon Password" to any command line option. When you set up your command line, you can also change your RCon Password. Keep in mind, changes will not reflect upon your RCon Password as listed within your billing panel on our front facing website unless you contact us and ask us to refetch your billing information. This is also a security feature, allowing you to lock out users which may have access to your GSK account's billing panel, but not your TCAdmin account. Every month, rust requires and automatic server wipe. This is to ensure that servers always have a fresh feel. If you'd like weekly wipes or even nightly wipes you can manually do so by following this section of the guide. It's very simple to do, but keep in mind it's best to tell your users first! Otherwise, you could be brewing an unhappy demographic within your server. It's very simple to generate a new map with rust. All you need to do is log into our server management panel using your TCAdmin information given to you inside your verification email. From there, go to "Game Services," and then to your "File Manager." Within the file manager, you must click on the server folder, and then the myserver folder. From there select the files which have the .map and .sav extensions. You can choose to back them up at this point by compressing them into a zip file and downloading that. If you don't want to do that, just delete the files. From there, you can change settings such as level type, map size, or seed if you choose. When you're done with that, go back to your "Game Services" section and click "Refresh" to reboot your server. Upon server initialization, your server will begin to regenerate new map files. The process for wiping your server is very similar to generating a new map. In fact, generating a new map will be seen as wiping your server from many server list sites as well as the Rust:IO plugin. To wipe your server, first, you must log into our server management panel by using the TCAdmin information sent to you inside your verification email. From there, click on "Game Services" and then go to your File Manager. Alternatively, you can use FileZilla or any FTP Client to access your server files. From there, enter your server folder, then your myserver folder. You will be greeted with a bunch of files, select and delete any files which end in .map, .sav, or .db within the myserver folder. You may compress them into a zip file to download them first, if you'd like, although, once the server reboots you will not be able to reuse these files easily. Once you've completed this task, go back to your "Game Services" tab and click "Reset." This will reboot your server, and from there, your server will regenerate the rest of the files. You've just wiped your server! The default map level for Rust is "procedural." Some people want to play on official map types which are run by facepunch. This is very doable as it just requires some minor command line editing. 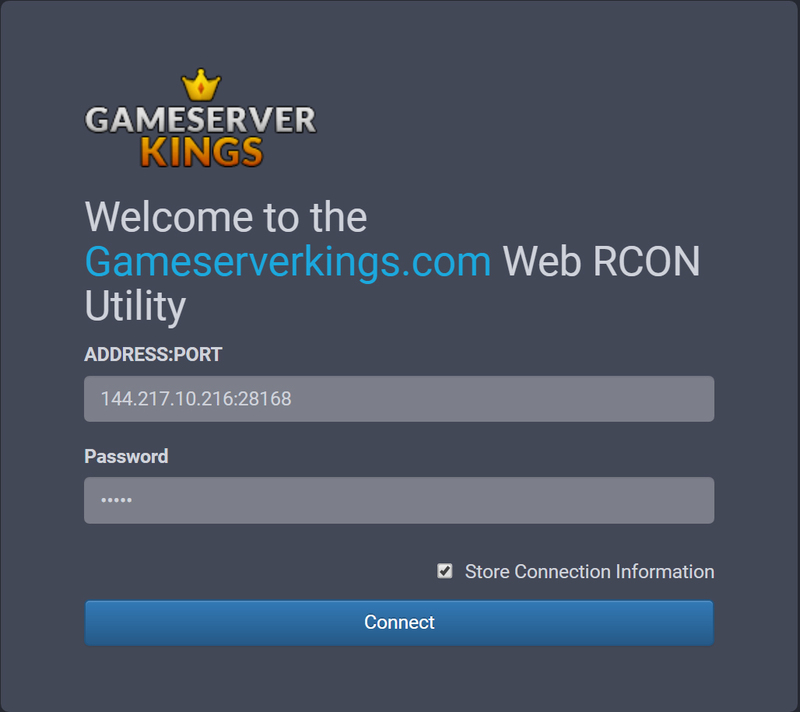 Game Server Kings makes this easy, all you need to do is log into our game server manager panel with your TCAdmin information sent to you inside your verification email. Once logged in, go to your "Game Services" tab and click on "Commandline Manager." From there, click on the "custom commandlines" tab to add arguments to a new commandline. From there, click on the checkbox next to "Server Level" and select the level which you want to use for your server. Click save, and then go back to your "custom commandlines" tab, find your new command line, and press select to have it run. Wipe your server, and then reboot. You've just applied a new map level, congratulations! We recommend using several tools and plugins with our rust servers. Among these are RCON tools. These allow you to manage and update changes on your server from your RCON console anywhere with an internet connection. Within this section we'll be covering two very powerful server administration tools which you can use for your Game Server Kings Rust server. This is VERY IMPORTANT. Before you use either of these tools you must make sure that within your server.cfg file, the only command regarding RCON is rcon.web "1". If there is anything else, such as rcon.password or rcon.port, you need to delete these commands for this to work. This is because if there are any commands regarding rcon use other than rcon.web within your config file, besides the fact that these commands are command line only and will do nothing, Rust will bind the RCON output to the game server port, not allowing other utilities such as Rust:IO or lusty maps to work in tandem with RCON. The WebRCON Utility is a tool which we have crafted to allow our customers and beyond to access the webrcon protocol used by Rust. This allows server owners to connect to, not only their GameServerKings server's remote console from anywhere, but all servers even if they're not hosted by us. As this is a mobile-friendly website you can use this service anywhere. All you need to do is ensure that your command rcon.web is set to "1" within your server.cfg file located at /server/myserver/cfg/server.cfg. If it is set to 0, Rust will not allow external sources to access your console. You will need some information first to access the WebRCON utility. First, you'll need your RCON Connection address and your RCON Password. Both of these can be found with your server management panel. Log in using your TCAdmin information provided to you inside your verification email. From there, go to "Game Services" Within this page you will find your RCON IP. Save that for later use. Then follow this guide on how to find your RCON Password. Once you have both, use the RCON IP and port as the username and your RCON IP as the password with our WebRCON Utility. Now that you're logged in you have information about your server such as uptime, memory usage, the current game time and more. To access the console, click "Console" in the left-hand navbar. From there you can use the Remote Console functionality. Rust Admin is a powerful tool written by Oxidemod user Vfloyd. It allows you to view user metrics such as who is online, what their steamID is, their VAC Bans, RustAdmin Bans, etc. It also shows Kills statistics, gives you access to chat consoles, Oxide consoles, and RCON consoles. RustAdmin also works as a Remote Console client so you can moderate your server away from home. To use this tool is very simple. It will ask for your RCON Password, which you can find using this guide, and your Server IP, your Game port, and your RCON Port. To find your Connection information log into your server management panel and log in using your TCAdmin log in information sent to you inside your verification email. From there, click on "Game Services" and your connection info will be listed on the top of the screen. There, you will see information labeled "Connection info" and "Rcon info." Your server IP is the IP address before the colon. Your Game port is the port number after the colon listed under "Connection info." Your RCON Port is the port number after the colon listed under "Rcon info." Once you gain this information, go under the configuration tab within RustAdmin and you'll see the option "RCON type" Select "WebRcon" Under Server, insert your information for IP, Server Port, Rcon Port, and password. The Password field is your RCON Password, not your TCAdmin password. You can choose to auto-reconnect and/or connect at startup. Now that your login information is set, go to the top of the screen and click server. A drop-down menu will appear with the option to connect. Press connect and you will now be connected to your server. Now that you're connected you can use the full power of RustAdmin.